There’s something extra magical about a winter wedding. The snow is falling, the newlyweds are snuggling extra close, and the branches and ground have that fresh coat of white powder – a perfect winter wonderland backdrop. I applaud those couples that brave the elements to snap that perfect shot. A dip in temperature shouldn’t stop you from capturing a clear blue sky and setting sun. If you’re planning an outdoor photo shoot, keep these toasty tips in mind to ensure you’re warm and cozy from beginning to end. It’s no secret that you’re standing outside in the cold, so you might as well dress the part. Lots of layers are ideal during the winter months and the same goes for wedding gowns. If layers of silk and tulle aren’t on the checklist, then another option for a full-length dress is leggings, or some good old- fashioned footless long johns. You’ll be nice and warm and no one will be the wiser. If you also opt for long dresses for your maids, thermal leggings will be a well-received gift to your girls. Just slip them off before heading into the reception. warmth, without taking away from the beauty and elegance of the gown. Floor length cloaks and capes – some with hoods – are also a dramatic accessory that work beautifully for the bride and her girls. It would be every bride’s nightmare to stick her sparkly Kate Spade pumps into 10 inches of snow. Kick off those heels and trade them in for a chic pair of Hunters, UGGs or some other fabulous rubber or faux-fur boot. This may seem like an extreme miss-match, but you’d be surprised just how popular this look has become. UGG Australia has actually created a fun line of bridal boots for an occasion such as this. With a peppering of bling and “Just Married” inscribed on the back, these comfy boots will fit right in with your winter wedding photo shoot. While the bride may not want to harm that updo that took hours to create, the groom may have no problem grabbing a toque or newsboy cap. A good alternative for the bride is earmuffs or a headband. Leather gloves and wool scarves also look fabulous when paired with a beautiful white dress or a sleek tux. You can also opt for a half glove, which provides a bit of warmth without covering up that French manicure! When you’re not in the spotlight, bundle up. Bring coats, hats, gloves, and whatever else necessary to keep you warm while you wait. Photographers have captured beautiful shots of couples wearing their winter coats over their wedding attire. Several restaurants use heat lamps to warm their evening patio diners. So why not add a few to your photo shoot? They radiate serious heat and look chic in almost any setting. They’re also not hard to find. Home stores like Canadian Tire, Home Depot and RONA all carry beautiful heating devices for outdoor use. Blankets are also a great prop for an outdoor photo shoot. Cuddle up and get close to your wedding party under a few heavy blankets. Choose fabrics and colours that complement your attire. When the body’s temperature starts to drop, the skin can become very dry. Make sure to moisturize daily leading up to the day to ensure silky smooth skin. Keep a lip moisturizer (and a small mirror) nearby to keep those puckers looking and feeling fresh. You’ll be doing lots of smiling, so have your MOH or photographer do regular checks to make sure you’re well moisturized. You may want someone to bring yummy hot chocolate or herbal tea to the shoot. A few sips here and there will warm those insides. There are several single-use air- activated heat pack products that promise temporary heat satisfaction. Just stick them in your pockets or inside your gloves and they’ll radiate heat for up to seven hours. 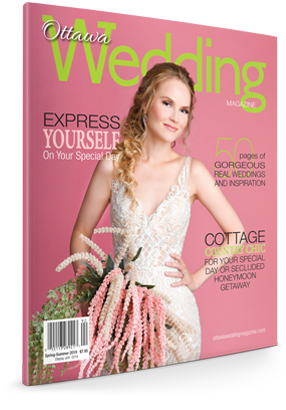 *This story first appeared in the fall/winter 2015 edition of Ottawa Wedding Magazine.